The Industry Summit is less than 48 hours old and already a heated topic has been brought to the forefront with Panini's new slogan, "2011- The Year of the Hobby Shop". Minimum pricing, early release protectionism and more are part of what Panini has described as the winning formula and necessary moves for the long-term health of The Hobby. 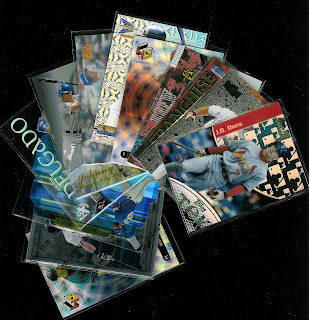 While I am sure there are many well run Local Card Shops, I am all too intimately familiar with several that are run by people with no business acumen whatsoever, who believe they are still operating in the early '90's and that this whole Internet thing is just a fad or passing fancy. Disorganized stores, unhelpful customer service, over inflated prices, inventory so old it collects dust, no online presence, no in store customer interaction opportunities. While I enjoy going to a good card shop like anyone, as a full time employee, father, and husband, I have little time, if any, to actually make my hobby purchases there. The Internet has revolutionized the way we live, interact with each other, and purchase goods and services. To employ a marketing strategy that protects a fragment of the market as a whole seems silly. But so does loading Target and Wal-Mart with Topps Heritage product over a week before your LCS but what do I know. So enough of my still formulating rant and opinion and before you chastise me, I really do understand the importance of a well run LCS. Well run, obviously being the operative phrase here. The real purpose of this post is to hear from the only people that really matter, YOU, the collector about the LCS's out there that make you shake your head and wonder how they are still in business. Also, to you pundits and naysayers, I'll follow this up with nominations for The Best LCS, but for now I am more focused on getting a better read on exactly what it is that Panini and Upper Deck think is so important to be supporting through price and distribution manipulation. So please provide the name of the store, city, state, and reasons why you think they are one of the worst shops in the country.